Since 2011, when the DIA Group was listed on the stock market, the investment community has become a key interest group for the company. In addition to working towards fulfilling its profitability expectations, DIA is also working on building a relationship of trust with its investors by complying with the law and focusing on a solid governance system and fluid and transparent communication over and above what is legally required. The DIA Group is present in the FTSE4Good international stock market index, which includes listed companies from around the world that offer information about parameters such as corporate social responsibility practices related to the environment, shareholder relations, and human rights. This index is reviewed twice a year, to include new companies and remove those that no longer publish the required information. FTSE4Good uses information provided by the Ethical Investment Research Service, an ethical research and investment service created in partnership with UNICEF and the UN Fund for Children. 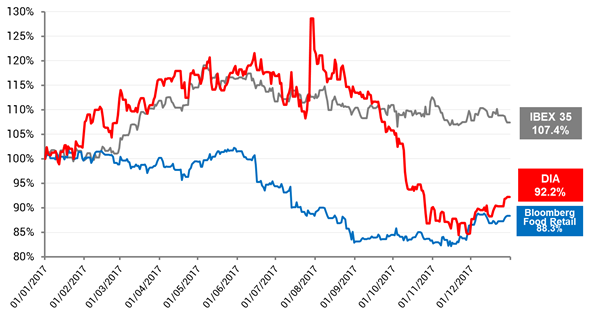 During 2017, the company’s stock market performance continued to display the same traits it has shown since the group was listed six years ago. Solidity, efficiency, and profitability define DIA’s performance since the start, in a context of fluctuating consumer demand both in Europe and Latin America, the group’s main business areas. 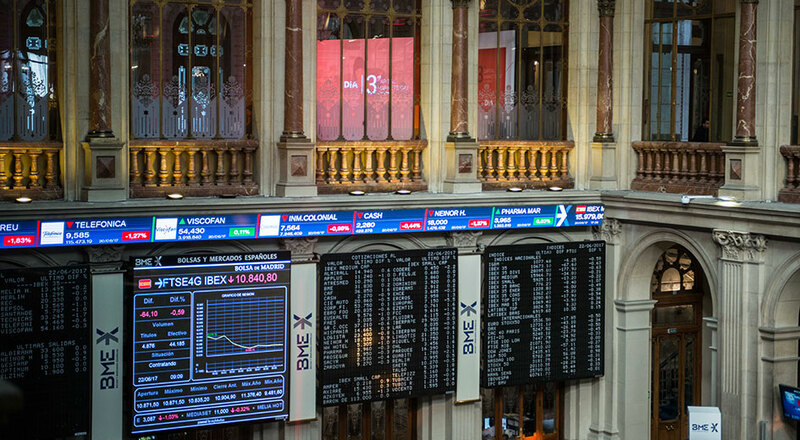 The company’s shares, which trade on the Madrid stock exchange and are part of the IBEX 35, ended 2017 at a price of EUR4.303. While this closing price represents a 7.8% drop over the total fiscal year, the total increase since DIA was listed in 2011 is 34.3%. DIA’s stock market performance during 2017 was also marked by the entry of the British investment firm LetterOne Investment Holdings into the shareholding structure, with 3% of the share capital, after having acquired 18.7m ordinary shares. In addition to this acquisition, there was the announcement of a collateralised forward agreement for the purchase of 43.6m ordinary shares, equivalent to 7% of the capital. The transaction, which was made public on 28 July 2017, made LetterOne Investment Holdings the group’s new main shareholder. 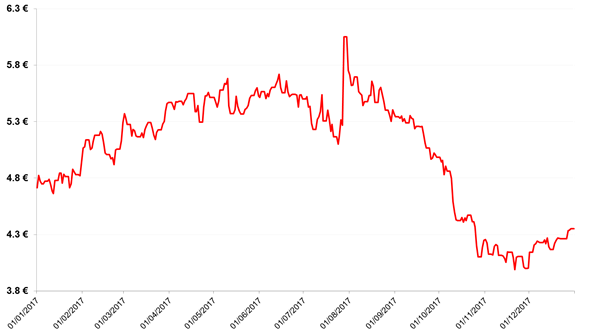 During 2017, the highest closing price was on 28 July, at EUR6.00 per share, and the lowest closing price was on 31 November, at EUR3.938 per share. The average daily trading volume was 5.1m shares, making DIA one of the most traded companies in the IBEX 35 during the fiscal year. Proof of DIA’s commitment to shareholders year after year, the AGM held on 28 April 2017 saw the approval for yet another year of an increase in the dividend payout, with the payment on 18 July 2017 of a gross dividend of EUR0.21 per share and charged to the 2016 results, which implies a 5% increase versus the previous fiscal year, as well as cumulative growth of 90.9% since the company was listed in 2011. The dividend shared among its shareholders represents a payout calculated on the underlying net profit of 49.8%, representing a total dividend payout of around EUR128.5m to shareholders. 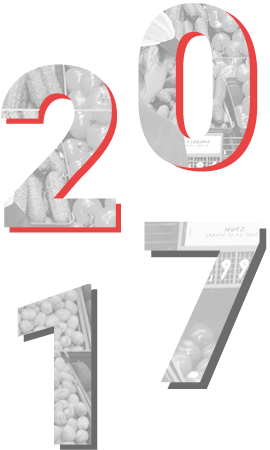 During 2017, DIA had an average treasury stock of 10.6m shares (1.7% of its capital). As for 2018, the Junta General will propose to its shareholders the distribution of a gross dividend of EUR0.18 and charged to the 2017 results. The DIA Group has a team made up of three people responsible for direct and transparent communication with investors. The principles that govern the Investment Community Relations team are approved by the Management Board in its Investor Communication Policy, which clearly outlines the courses of action to protect the rights related to individual shareholders, institutional investors, and market mechanisms in general. This policy, which must be complied with, is public, and can be referred to in English and Spanish on the Group’s corporate website. The on-going, efficient relationship with investors is maintained through several communication channels that are controlled and managed by the Investor Relations team. In addition to the absolute availability of those in charge by email and telephone, both of which are available on the corporate website, the company also offers real-time information on share price performance, relevant facts, Corporate Governance, and financial results on the same website (www.diacorporate.com). In addition to this data, the DIA Group has also set up a notification channel which investors can subscribe to in order to receive, in real time, the most relevant news about the Group’s performance. At the end of 2017, more than 1,600 investors and interested parties were subscribed to this channel. One of the company’s most high-profile communication initiatives during 2017 was the third Capital Markets Day that was simultaneously carried out in Madrid and London during the month of June. The company’s top directors, including the management board and the executive committee, described the company’s performance and the most imminent action plans to more than 100 people. Both the prior call as well as the information laid out therein were made public through these Relevant Facts, in addition to including all the documentation on the corporate website where it is freely available for any interested parties. 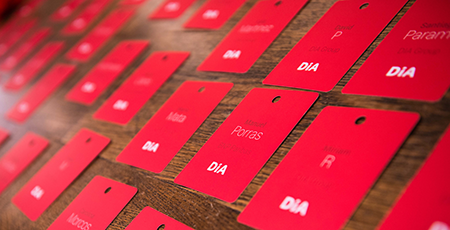 In addition to this activity, the DIA Group’s Investor Relations department organised more than 400 information activities in different contexts, such as face-to-face meetings, webcasts, and conference calls (102-43), which were all aimed at offering the most up-to-date and exact information to the market. The company’s most important events for its shareholders, such as its quarterly presentations and the Annual General Meetings, are available as webcasts, thus strengthening the company’s strategy of transparency and fluid communication with the investment community.